When Emerenc, the central character of István Szabó's "The Door," sweeps the pavement to rid it of snow, she looks like she's fighting an enemy. Every sweep is fierce and deliberate and there's a determination to the old woman's movements that testifies to far greater battles she's fought in the past. By the time she's done, the snow has covered the pavement again — which for Emerenc doesn't mean defeat. It just means more sweeping. Emerenc is played by Helen Mirren, who lends the character all the regal force contained in her Oscar-winning turn in "The Queen" (2006), even as she repackages it as working-class resilience. The film, which takes place in 1960s Hungary, opens with Mirren's character landing a job as a maid for a well-off married couple of Magda (Martina Gedeck) and Tibor (Károly Eperjes). Magda is an aspiring writer, hungry for inspiration and impressionable enough to quickly fall under the spell of her no-nonsense new servant. Even though we never get to hear excerpts from Magda's novel, it is made clear that it feeds off Emerenc's story and personality. Mirren's Emerenc is the ultimate tough cookie; she's not afraid to talk back to her employers and, in a subtle way, she ends up making them fawn over her. Had there been any malice to the character, she could have easily pulled off the sinister scenario played out by Dirk Bogarde in "The Servant." As it is, "The Door" is about something less abstract than mind games and power struggles — it's a careful character study. Emerenc's sense of order and duty are unshakable, but her past is scarred by war and death. She's a creature of contrasts, at once giving and withholding, cold and selfless, uneducated and wise. Despite her brusque demeanor, all living things are drawn to her. Dogs, kittens and children all seek refuge at her side, which actually turns out to be the basis for a crucial, if not-to-be-revealed, plot point. Magda's fascination with the woman leads her to inquire about long-buried secrets, best embodied by Emerenc's home -- forever shut to visitors and sharing its owner's burdens of the past. 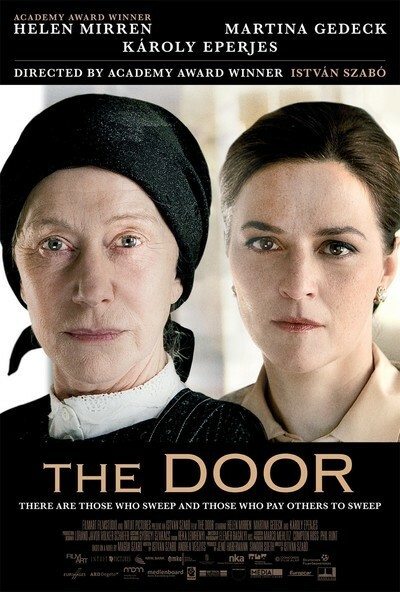 "The Door" is, ultimately, about two childless women with various capacity for care-giving: while Magda wallows in enough self-dramatization to join the cast of "Girls," Emerenc can be brutally self-effacing and doesn't make a fuss over her own heroic choices. Brightly lit and crisp throughout, the movie's look suggests the fresh linen that Emerenc so frequently handles. Visually, there's an elegance to "The Door" that feels both a virtue and a limitation. Szabó was never famous for visual flair, but he can still be a superb director of actors. Klaus Maria Brandauer gave the performance of a lifetime in his Oscar-winning "Mephisto" (1982), and Annette Bening received her third Oscar nomination for playing a larger-than-life thespian in Szabó's "Being Julia." As expected, Helen Mirren is very good in "The Door": stripped of glamour and clad in raggedy clothes in practically every scene, she's nevertheless so radiant that it's no surprise her screen partner Gedeck (of "The Lives of Others") ends up being overshadowed. Still, there's a feeling that Szabó works against Mirren at times. Her big monologue about childhood trauma ends up reduced to a mere voice-over, while the director cuts to an awful flashback sequence that suggests a straight-to-DVD remake of Tim Burton's "Sleepy Hollow." What the movie never discusses is the source of Magda and Tibor's privilege. Much is made of the jarring class differences between Emerenc and the married couple. The disparities range from dwelling conditions (old hut vs. spacious mansion) to matters of taste (rich decoration vs. china trinkets). The movie goes so far as as to have Emerenc give a curt lecture on applied Marxism ("The are two kinds of people in this world: those who sweep and those who get others to sweep"), and yet never answers the question of how on earth did Tibor and Magda achieve such high standard of living amidst the communist drabness of 1960s Hungary. The fact is that the only way for them to live it up (as we see them do), would be to ensconce themselves in upper echelons of the Communist Party, which would have to entail some level of compromise and/or entanglement in its totalitarian reign. The only scene that even hints at the subject comes when Magda receives a call from the minister of culture congratulating her on her novel, and Tibor reacts with fear, for he senses there might be some double meaning behind the praise. There's never any payoff to that brief scene, which is especially disappointing in a film by Szabó, whose "Mephisto" was a supreme examnation of what it takes to make it big as an artist under totalitarian rule. Magda writes a bestseller in communist Hungary, and there's not even a mention of the fact that any book published under the regime had to go through the hands of a state censor. Doesn't Magda care — an improbable trait in a writer — or is it Szabó…? I bet Emerenc wouldn't have let him off the hook the way he apparently expects us to.